Jennifer Boykin joined Newport News Shipbuilding as an engineer in 1987. Jennifer Boykin is no stranger to breaking the glass ceiling. As a child, she was the first girl in her hometown, St. Louis, to play Little League Baseball. 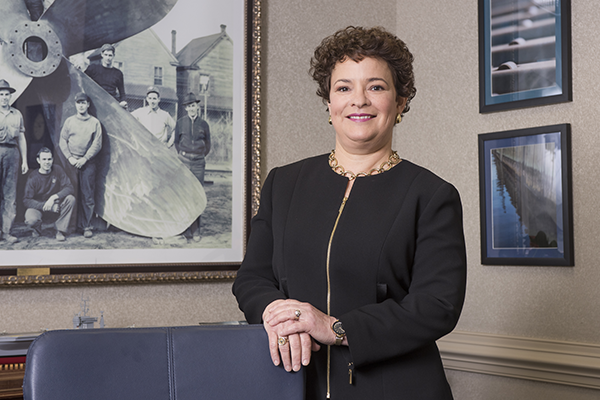 In July last year, she became the first female president of Newport News Shipbuilding, the sole builder of the Navy’s nuclear aircraft carriers and one of only two providers of Navy nuclear submarines. 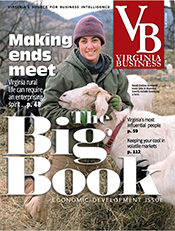 Boykin, 54, doesn’t point to any specific gender barriers on her way to leading Virginia’s largest industrial employer. Nonetheless, she is focused on making sure “the least empowered person in the room feels comfortable stating their view and opinion” and attracting more women and minorities to careers in math and science. She joined Newport News Shipbuilding as an engineer more than three decades ago, rising through the ranks in engineering and management positions. She now oversees a workforce that totals more than 22,600 employees, including hundreds of students being trained at the company’s Apprentice School. Boykin also is running Newport News Shipbuilding at a time when the Navy is considering expanding its fleet to 355 ships and shortening the time between the construction of new aircraft carriers. Both moves would mean more work for the shipyard. Outside of work, Boykin relaxes by reading or listening to audio books. Lately, she’s been “obsessed” with listening to the musical “Hamilton.” She also loves playing with her adopted dog, Max, a roughly 6-year-old mixed-breed. Boykin and her husband, Blake, have been married for almost 30 years. They met as classmates at the U.S. Merchant Marine Academy. Her daughter, Caroline, and son-in-law, Zachary, also work at Newport News Shipbuilding. 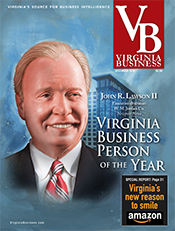 A few months shy of her first-year anniversary as president, Boykin sat down with Virginia Business at her office in Newport News to discuss her career, the importance of leveraging people and technology and the identity of Hampton Roads. Answers have been edited for length and clarity. 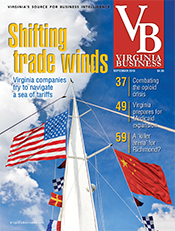 Virginia Business: You started working [at the shipyard] in 1987. How did you wind up here, and what was your first job here? 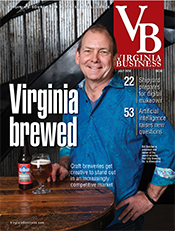 VB: [You’ve said in the past that] two of your priorities at the shipyard are leveraging people and technology. What are the biggest opportunities and challenges in those areas? 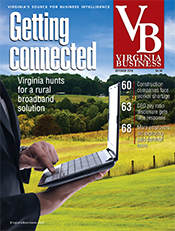 Boykin: Like so many other businesses, we are at the beginning stages of a digital transformation. What does that mean for shipbuilding? The gist of it is that we’re going to move from having our production teams building ships from drawings that unroll and lay out on the table, to using their [computer] tablets with a three-dimensional picture that I can rotate around on my tablet. [I would] have work instructions on my tablet, training videos and then, eventually, a little pop-up window where I can contact the designer and engineer, even showing them what I’m looking at to get technical help through my tablet. Then [I would be] able to complete my job, say that I’m finished and log in how many hours it took, etc., right there on my tablet. We aren’t at that stage yet, but that is the transition that we have planned and begun. We have work teams now using the tablets … to do project management. Think about building a house, and the general contractor is trying to coordinate the work between the Sheetrock guy and the electrician and the plumber. We do the same thing on ships. VB: What forces shaped you into the leader and person you are today? Boykin: We’re all shaped early on. I’m the middle child of five kids. I do tell people that when you come from a large family, you have the benefit of becoming better at receiving constructive criticisms because you’re born into it. Both of my parents were very strong advocates of all of us doing well in school. My father was an engineer with McDonnell-Douglas. My mother was a stay-at-home mom when we were young and then went back to school later in life and started her own business. She never stopped educating herself or working hard. I grew up in a naturally integrated community. There’s no question in my mind that shaped me as well. My elementary, [middle and high schools] were predominantly African-American. We all grew up playing Little League together. We were in the jazz band together. All of the activities I did as a young person were integrated because our community was. … Then, certainly, my time at the [United States Merchant Marine Academy] shaped me in a way that those experiences tend to. VB: What did you want to be when you were a little girl? Boykin: I wanted be an engineer because my dad was. I was very much a tomboy when I was young. I was the middle of five so I had an older brother and a younger brother. I was one of those kids that if my dad was going to do something with those two, I was determined to be in the middle of it. I was the first girl in St. Louis to play Little League Baseball and other sports. But, I actually wanted to be an engineer before I really knew what that was. I knew that, and I heard from all the teachers along the way, [that because] I was good at math and science, “You should be an engineer.” So, I never really got off that track. VB: There’s been talk of expanding the Navy to a 355-ship fleet. How likely is that to happen? How are you preparing for this potential ramp-up? Boykin: The likeliness [of that happening is] a better question for the Navy to answer. What I can tell you is what we’re doing. We have invested over a billion dollars in the shipyard, in facilities, over the last five years, and we have a planned investment of over another billion dollars, like a billion and a half, over the next five years. We are investing in the plant so that we can build for Virginia-class [submarines] at two per year… and also get prepared for the Columbia-class submarine. We work with the Navy, and we have two submarines in the yard right now that we’re doing overhauls on. So, we are working with the Navy. We have also invested in the part of the shipyard that does fleet support for submarines. So, what we’re talking to [the Navy about is if] the naval shipyards become full or overcapacity, based on their size and based on how much work they can do, we’re prepared to do more submarine maintenance here in the [Newport News shipyard]. 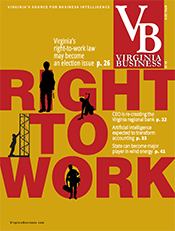 VB: But from a workforce standpoint? Boykin: From a workforce standpoint we’re hiring over 400 people a month right now. We started hiring at that rate late last year, and we’ll be hiring over 400 a month until this summer. Then the hiring will level off to cover attrition, and so we’ll get somewhere around 25,000 and will sustain at 25,000. VB: You’re a big advocate of Science, Technology, Engineering and Math (STEM), which doesn’t draw as many women. What are you doing at the shipyard to get more women in the field? Boykin: It’s not only more women, more people in general. If you look at the statistics nationally, STEM fields are very underrepresented by both women and minorities. We have a very active career pathways organization, which basically, through volunteers, [works] in the school systems — elementary, middle and high school level. We started a program in particular for young girls a few years ago called GEMS. It stands for Girls with Engineering Minds in Shipbuilding. That’s a program targeting middle-school girls. We’ve gone from one school to two, with kind of a plan to grow that. It’s intended to give them the confidence that they need to not drop out of math and science classes in the middle-school ages. Now, we are growing the program so that [the employees] become mentors to the younger girls as they go through that. 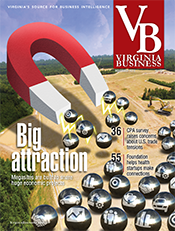 That program, working with the city of Newport News and Old Dominion University, has grown into what we’re calling Project Vision. Project Vision is an idea that [emerged] from a lot of the career pathways and GEMS work. 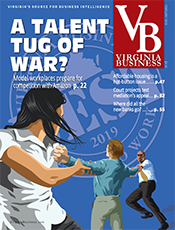 We’re building, with the city of Newport News, a new office building at the East End of Newport News, which is in one of the more underrepresented areas. Our employees will be on the second, third and fourth floors. It’s going to be a lot of the people who are doing the digital shipbuilding work — engineers, planners, some IT people. The first floor, though, is going to be a community center that the city of Newport News will own. 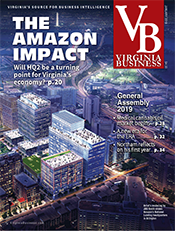 Old Dominion University is going to operate that, and we’re working together, and we already have a couple of large IT company partners that want to work this with us. The exact [plan for] how we are going to use this space and what it’s going to become hasn’t really been defined, but the idea is that it will be used for both workforce development and STEM outreach. Part of the challenge that schools described to us is for the younger kids to have laboratory time. What we would provide is volunteers and time and even some of the tools and some of the software. Companies will provide some of that as well. The idea is for these students in the East End of Newport News, in their own neighborhood, to be able to come to this community center and really learn some basic software programming, computer programming types of skills to level their playing field. So that, as they grow through life, they don’t find themselves at a disadvantage, which is really again why there is such a disparity in the number of women and minorities in the STEM fields. 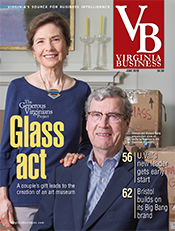 VB: I wanted to talk about … the glass ceiling, since you’re the first woman to lead the shipyard. What have been the biggest barriers you have faced as a woman, and how did you overcome those barriers? Boykin: The only real barrier, I would say, was when I started at the shipyard, we still weren’t allowing women into the radiological controls program for some roles in the shipyard. That was a barrier. Fairly early on, the leadership team here — that was in charge at Newport News Shipbuilding — recognized that and did away with that restriction. While there are always biases, I can’t say that I faced any particular barrier here. We have a very active inclusion and diversity program. We have a long way to go, but we are really determined to create a work environment where, as we say, the least empowered person in the room feels comfortable stating their view and opinion. I think the biggest opportunity we have and the challenge we have and the responsibility as leaders, is to make sure we give people opportunities to develop, to be seen, to be recognized and to grow. Those opportunities are given to all employees so that everyone has a fair chance at making sure they have equal opportunity for job promotions and for new jobs as they come along. 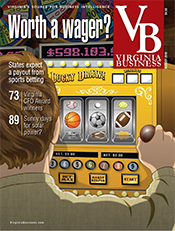 VB: This is going to be for our July issue. You will have been in your position for a year. What has the experience been like so far? Has it been what you thought it would be? Boykin: I’m not sure exactly what I thought it would be. … I’m very excited still with the opportunity we have with a two-ship carrier buy to really change the business to be a digital shipbuilding business. I was excited before I came in, and I continue to be excited about that opportunity. … [I also have been] honored by the opportunity to do things in our factory that really put the basic needs of our shipbuilders in the front as a priority. We are spending time and money solving basic employee needs like trying to alleviate the parking challenges, creating more [meeting and eating spaces throughout the yard and upgrading restroom facilities]. Those investments in our people were some of the things — we started this talking about how my priority was people and technology — these were at the front of the people priority for me. VB: Did you ever have a mentor? Boykin: Many mentors, including Matt Mulherin, who’s my predecessor [as president of Newport News Shipbuilding], and Mike Petters, who is my current boss [at Huntington Ingalls Industries, the parent company]. I have probably learned more from the people I was fortunate enough to lead. I would move into a new division, or a new part of the business, and there were people that understood that part of the business, and that’s who I learned from. Senior leaders have mentored me in the art of leadership. They — the workforce — have taught me shipbuilding.